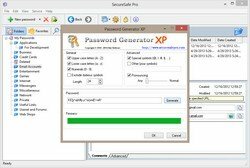 Password Keeper SecureSafe Pro keeps your passwords and files in a secure storage on your computer , protected by a master password and military-grade encryption algorithm AES-256. 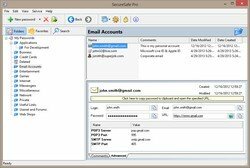 If you have dozens of access passwords and logins and would like to protect your identity against identity theft and need a reliable software solution to keep passwords and files with confidential information in one place safely and securely, you need to get SecureSafe Pro Password Keeper. Download and try it just now - it is free to try. Why choose SecureSafe Pro Password Keeper? 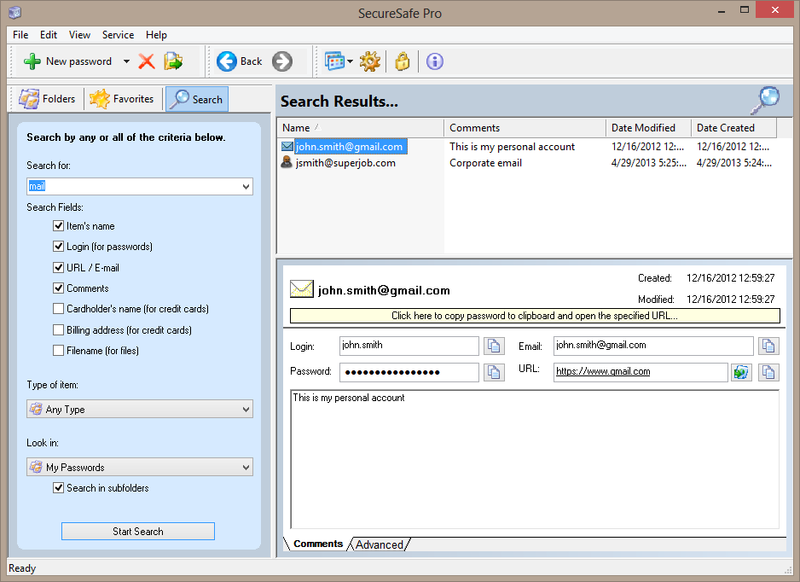 First, SecureSafe Pro password keeper is 100% free to download and try. Second, it uses military-grade encryption standard approved and used by the US Department of Defense (namely AES, Advanced Encryption Standard with 256-bit key). Third, it frees you from having to remember all of your passwords and logins. 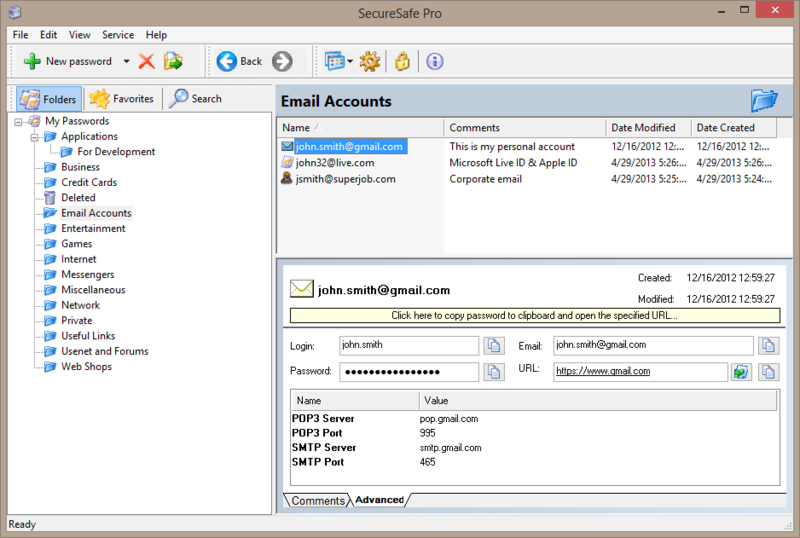 SecureSafe Pro password keeper keeps all your access passwords and logins. They are stored in a database tree, which is very easy to organize, search and navigate. 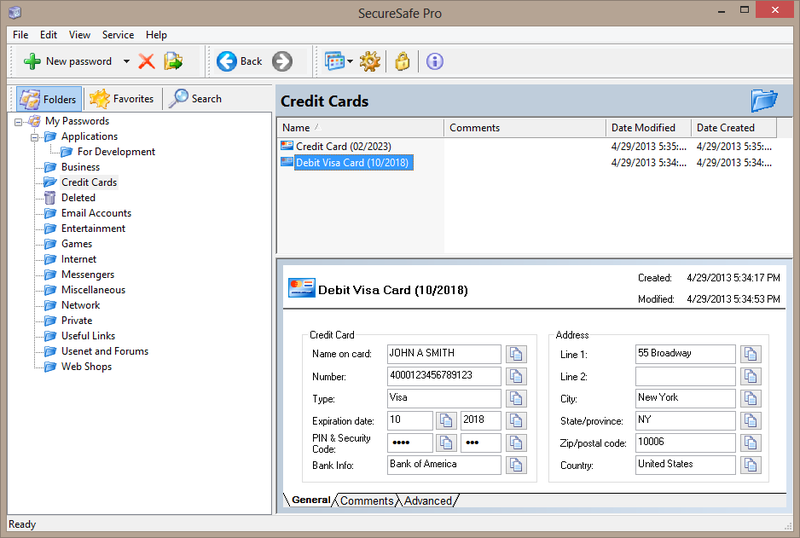 SecureSafe Pro password keeper allows to use fully customizable fields for each item and 330+ custom icons for each item. 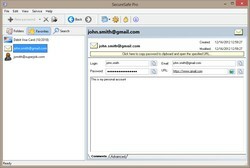 SecureSafe Pro password keeper can be installed on a flash drive and work as a usb password keeper (i.e. portable password keeper). 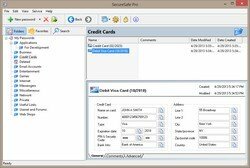 When you visit a site you need access to, simply click SecureSafe Pro icon conveniently located in the system tray, enter your access password and that's it. Never check "Remember my login and password" box on web sites, since this is not safe and may lead to hackers getting access to your private information, or worse yet - stealing your identity. Use SecureSafe Pro Password Keeper instead. Moreover, the program comes with a number of safety precautions, like unloading access data if program is left idle. Plus, it has a "tough random password generator" feature. Fourth, this program is not just another password keeper. You can store regular files secure. 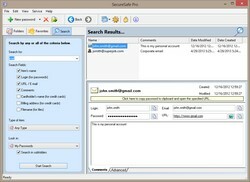 The program can store any file, and all files can be launched from SecureSafe Pro Password Keeper. The files stored with SecureSafe Pro Password Keeper won't be visible and accessible to anybody but you. There are no limits to how many password you can keep and the program is incredibly easy to use. 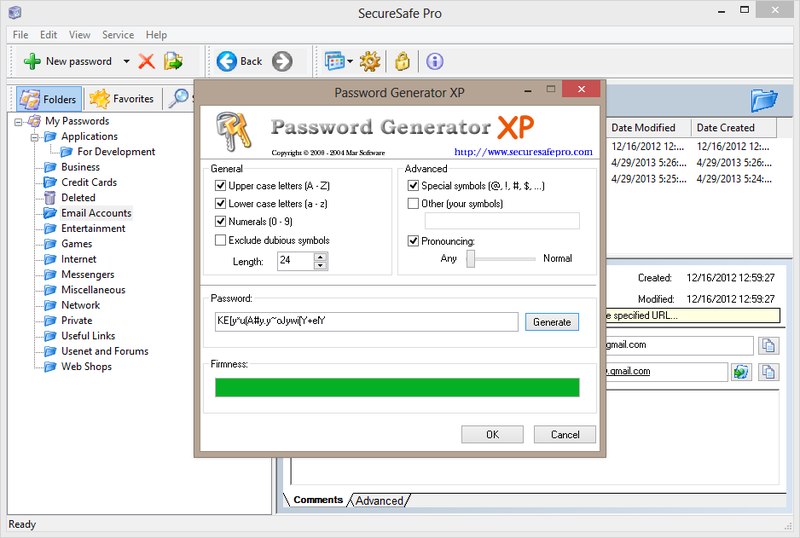 If you find any solution that works better than SecureSafe Pro Password Keeper, let us know. But since such a program has not been released yet, we suggest you to take advantage of your free SecureSafe Pro Password Keeper test drive. Both 32 and 64 bit editions of Windows 10, Windows 8.1, Windows 8, Windows 7, Windows Vista, Windows XP. 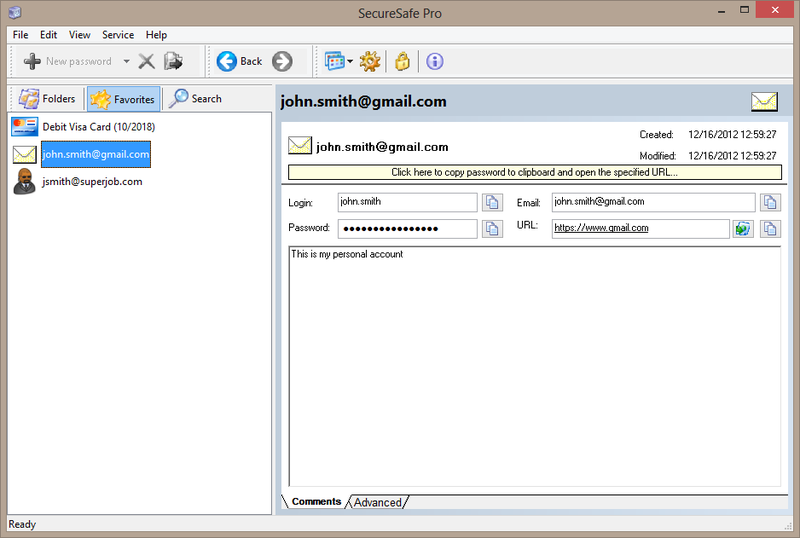 Under Windows 10, Windows 8.1 and Windows 8 SecureSafe Pro Password Keeper works as a desktop application. A password keeper for Windows. Use individual and strong passwords for each login place. Keep all passwords in one place protected by a single password and military grade encryption (namely AES, Advanced Encryption Standard with 256-bit key). Fully customizable fields - you can store any kind of data. Keep files inside! You can keep any file inside the program and run it. 5 predefined templates: for passwords, credit cards, files, notes and URLs. More than 300 icons for customizing your data. Fair price includes all sales taxes.